A GROUP OF parents with young autistic children visited the store this morning. The idea was for me to play a few instruments and introduce them to different noises and sounds, and how to play them. As always, it's an awesome reminder of the power of music. We started with a ukulele, and each child got to strum on one. We had the teacher play a flute and tell them about it. Then I showed them an acoustic guitar and electric guitar, a bass and a keyboard. This was the watch and learn part, and the children were very curious about all the strange noises. Then came the fun part - kazoos! 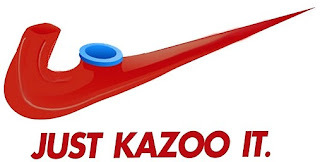 Each child was given a kazoo and taught how to hum into it. I wish you were here to see the reaction on each child's face as he or she started making noise. That's all it is, making noise - but it's magical, and the pure delight and awe on their faces told the story. Same goes for the parents! We've got another group coming in this afternoon and we'll make more noise. Music is already a big part of the early childhood curriculum, and I hope it remains a constant and positive thing in their lives as they grow older.